Kitchens, Baths & Beyond offers a large inventory of prefinished solid and engineered wood flooring, and luxury vinyl tile. 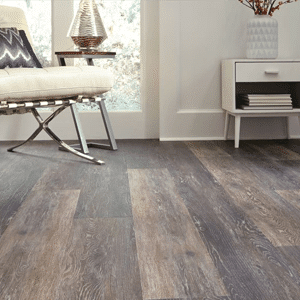 Flooring is an integral part of your home, so we carry products that range from budget-friendly vinyl to high-end solid wood. With an emphasis on the finest quality, unmatched selection, superior customer service, and exceptional value, Kitchens, Baths & Beyond serves the greater Mt. Pleasant/Charleston area. Come visit us today at our Mt. Pleasant showroom! Prefinished solid wood is one piece of wood 3/4″thick that is sealed on all 6 sides. 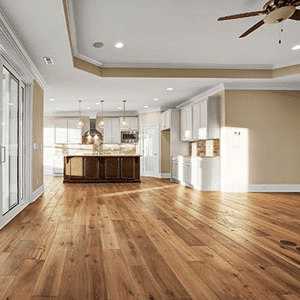 The main benefit over engineered is the ability to sand/ and refinish flooring numerous times. Solid wood has excellent durability and high resale value. Engineered wood is layered with plywood and topped with a thin piece of hardwood. 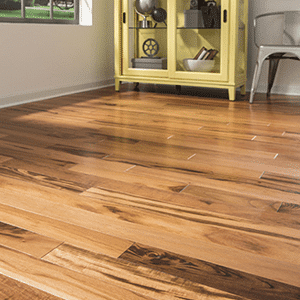 This wood is preferred in the Charleston location due to its moisture-resistant properties. Engineered wood is easier to install when compared to solid wood. 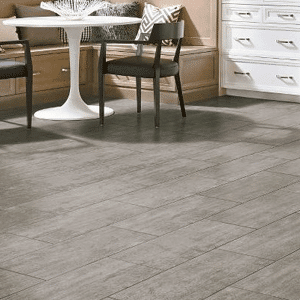 LVT is a product that looks and feels like stone, ceramic tile, and wood without the high price tag. The advantages of LVT is water-resistant, pet-friendly, and durable. What services does Kitchens, Baths & Beyond offer? Whether you’re looking for flooring Mount Pleasant SC or just about anything else related to kitchens, baths (and beyond), we can make your dreams come true. We provide design, inspiration, materials and workmanship as the area’s source for turnkey home renovation solutions. From vinyl and hardwood flooring to closets, cabinetry and more, Kitchens, Baths & Beyond is here to take you from dream to delight. Why should I hire Kitchens, Baths & Beyond for my project? 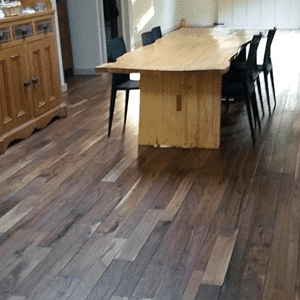 We know that you have numerous companies to choose from when it comes to installing engineered wood flooring Mount Pleasant SC or any other design/installation job for your home. What makes us stand out is that we strive to exceed your expectations in all aspects of your home-improvement journey. 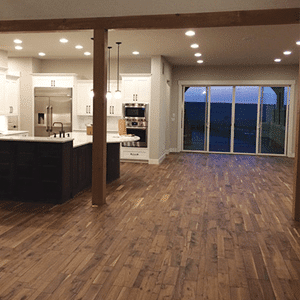 We are experienced, knowledgeable and committed to making our clients’ dreams come true, regardless of whether they’re looking for new flooring Mount Pleasant SC, or they are considering a full bathroom or kitchen redesign and remodel. I want to remodel my kitchen or bathroom — how much will it cost, and how long will it take? It all depends on the complexity of the project. The design phase of the project can be done quickly, but we work as long as it takes to make sure our clients are completely satisfied before moving forward to the next phase. Once the design has been fully approved, the time between demolition and complete renovation is approximately eight weeks. Again, timeframes can vary considerably, so we suggest contacting us so you and a professional designer can determine your needs. From there, you will gain a more accurate perspective of the time required to complete your project. As far as costs are concerned, the complexity of the project and the expense of the materials chosen will determine how much you spend. As a general rule of thumb, expect to budget approximately 10-20% of your home’s market value for a full kitchen or bathroom remodel. Do you do more than just kitchens and baths? We have a great reputation for bringing our clients the best when it comes to all things home flooring Mount Pleasant SC, and our ability to transform bathrooms is second to none. But we also work with kitchen flooring Mount Pleasant SC and much more for other rooms of the house, including offices, studys and laundry rooms. Check out our gallery here and take a look at what we can do for your kitchen or bath. We also encourage you to visit our flooring showroom Mount Pleasant SC so you can see in person exactly what our designers are capable of doing for you and your home. I’m looking for the best hardwood flooring has to offer. Why should I turn to Kitchens, Baths and Beyond? 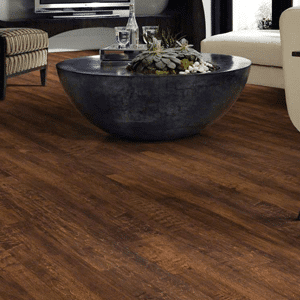 New flooring adds value, character and distinction to any home, but it needs to be designed and installed properly. When done unprofessionally, it can make a space seem unfinished and disconnected from the desired aesthetic. But when you hire Kitchens, Baths & Beyond for your project, you can rest assured knowing that your hardwood or vinyl flooring will look and feel just like you imagined — if not better! 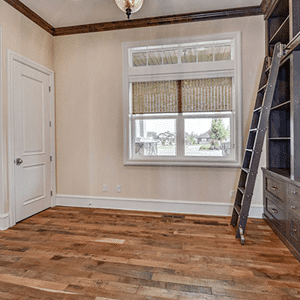 Where is your hardwood flooring showroom in Mount Pleasant SC located? Our address is 2447 N. Highway 17, Mount Pleasant SC 29446. We are located next to Boone Hall Country Store on the second floor of the building we share with Budget Blinds. Need help getting here? Give us a call at 843-881-9566. Stop by to see all of the options we have available for flooring Mount Pleasant SC and much more! What are your hardwood flooring showroom hours? 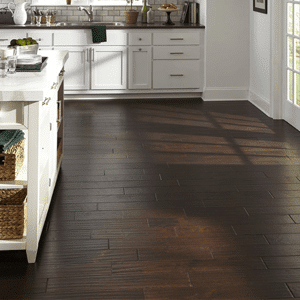 What types of kitchen flooring do you offer? We specialize in hardwood flooring Mount Pleasant SC, but we also perform expert work with engineered surfaces. How much do you charge for in-home consultations? Our in-home consultations are absolutely FREE! Call us today at 843-881-9566 to schedule yours. How can I find out what others have to say about the work Kitchens, Baths & Beyond has done for them? We understand that you’re making a big investment, so it’s important to learn what other people have to say before choosing a firm for your design and installation needs. Thankfully, we have no shortage of fantastic reviews from satisfied clients. Read them here. How long has Kitchens, Baths & Beyond been doing business? Kitchens, Baths & Beyond was created in 2011 by owner Jack Demsheck after 20 years of doing business in New York (as well as a short stint in retired life). We bring tons of experience and know-how to our work, and we’re always excited to partner with homeowners for turnkey renovations or new construction material sales here in the Mount Pleasant area.